I’m not sure how long I have been using these. I think it’s something I purchased back in 1994 after seeing all of the anglers using them at the World Championships at Holme Pierpoint, Nottingham. If you are fishing a venue like Drayton where there is a large head of fish you will get through a lot of groundbait! Having a big container to mix everything in saves time and results in a better mix. The bucket is a much better option than a standard collapsible mixing bowl, the smooth sides stop the mix getting caught up and helps ensure the water is evenly distributed. After mixing the bait you should use a riddle to improve the consistency. If you have a couple of buckets, put a maggot riddle over one and then tip the mix through. The buckets are also good for storing bait in while you are fishing. Leaving groudbait out during a session will mean that it slowly changes consistency. If it is hot then the mix will dry out, if it is raining you will end up with slop! Either way it will have an effect on your bait presentation, that perfect heavy mix which should be breaking up when it hits the bottom will be scattering your bait everywhere from mid water if it gets dried up in the sun. 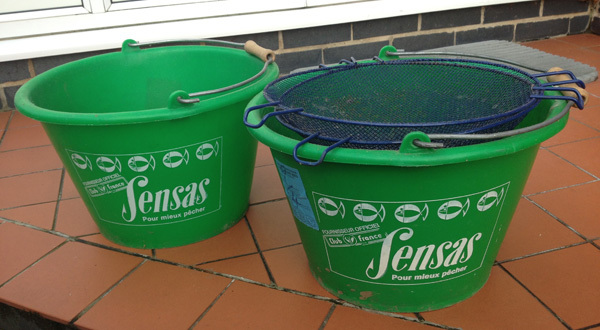 Keep your bait covered up in the bucket and just keep tipping it out into a different bowl as and when you need it. There are quite a few other buckets on the market. The pack from Preston Innovations looks quite useful, with a range of different bowls an a knuckle to attach it to one of your sweatbox legs. Next time you see these in your local tackle shop, pick one up!